The 1998 Belgian Grand Prix at Spa Francorchamps was undoubtedly the most incident packed, exciting and historic race since the 1997 title-decider at Jerez. Once again, the spotlight of controversy focused on Michael Schumacher. This time he sensationally crashed out of a 37-second lead, subsequently venting his fury at a bemused David Coulthard, into whose rain-spray shrouded McLaren Schumacher's Ferrari collided. 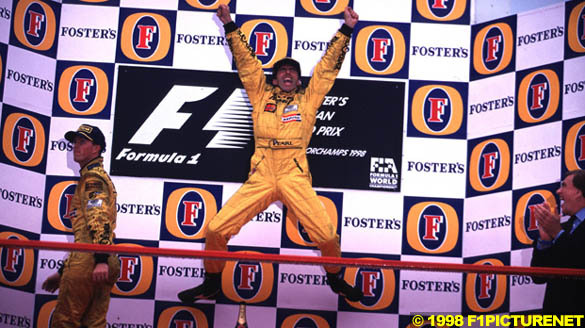 Meanwhile, Damon Hill's success-starved fans were rewarded with a strong performance all weekend which culminated in the 37 year-old's 22nd career win and Jordan's very first, with team mate Ralf Schumacher making it a glorious 1-2 for the Silverstone-based team. All this happened after the race was re-started. The first race was stopped after a huge pile up on the drag up from the extremely tight 60 kph La Source hairpin, which is the first corner from the starting line. No less than 15 out of the 22 starters suffered varying degrees of damage - ten cars were beyond repair - and four drivers were unable to restart, though thankfully there were no serious injuries, bar Rubens Barrichello who decided not to restart after suffering a bad knock to his elbow. Right from the start, this was no routine Grand Prix. On Saturday the track was cool and dry with conditions looking ideal. As we expected, the closeness of the championship race between Mika Hakkinen and Michael Schumacher would make for some exciting driving and in qualifying we were treated to a personal duel between Hakkinen and Coulthard in the other McLaren. Every time Coulthard went faster, Hakkinen shaved a few more tenths off. With just a couple of minutes to go before the checkered flag, the two were out once again, with the Finn just able to see his team mate ahead. Coulthard improved his sector times one by one, but just as he set the new times to beat, Hakkinen would promptly meet the challenge. Afterwards, Hakkinen revealed that he was amazed by his own performance in qualifying because he was far from convinced he could knock Coulthard off pole. "That was an unbelievable session," said a wide-eyed Hakkinen, "and I still can't explain it one hundred per cent. It was obviously going to be a great fight with David and before I went out on the last set of tyres, even though the limits were very small, I knew I would have to do something unbelievable because I had been on the limit on the run before." Coulthard was magnanimous in defeat. With a wry grin he explained: "Unfortunately, I know exactly where I lost it. I tried to sneak a bit more kerb going into the bus stop and I bottomed out the car on the left hand kerb, which made the car jump and throw me out of shape for the final part of the bus stop." Coulthard may have had to make do with second, but it was a great effort from both McLaren drivers, both inside last year's pole time - an incredible feat when you consider the rule changes this year to slow the cars down. In fact, it was a thrilling display of McLaren qualifying dominance, with Hakkinen over a second faster than the third placed man, Damon Hill. Damon Hill? Eddie Irvine recently called Hill the 'sad old man' of Formula One, but the 1996 champion was making Irvine eat his words this weekend. Irvine often reminds us there is nobody to touch his team mate, Michael Schumacher, but Hill had the added satisfaction of out-qualifying his old sparring partner fair and square. Already there was controversy surrounding Schumacher after he scored his best time while passing a waved yellow flag. That time demoted Hill to fourth place with one more run apiece to go. Damon needed to beat the time to be confident of retaking his third place, while Michael needed to equal the time or go faster in case the yellow flag time was disallowed. Schumacher and Hill exited their garages within seconds of each other and just a few hundred metres behind the electric McLarens also on their final runs. The four were set for a major fight, literally to the flag. On the out-lap Hill wasn't too keen to be behind Schumacher and weaved behind the Ferrari signalling to be let past. There was no response and the Jordan eventually dropped back to make space. While most eyes were on the two McLarens, as Schumacher crossed the line it was clear that he hadn't managed to beat his previous time which would eventually be taken away. But had Hill beaten him anyway? - the answer was yes, by under a tenth of a second. Afterwards, Schumacher ignored questions designed to re-ignite the old rivalry with Hill, even suggesting that he had indeed lost a couple of tenths when he saw the yellows. In the main, he was very unhappy at how far off the McLaren pace he and Irvine, half a second behind in 5th, were. Hill, on the other hand was buzzing. "Absolutely brilliant. I am very happy," he enthused, and continued by abandoning his trademark modesty by adding: "I also have to say that I think I am driving beautifully at the moment, and I am really enjoying myself." It would only get better. Elsewhere, Jacques Villeneuve was, under the circumstances, a creditable sixth on the grid. The day before he had all-but destroyed his Williams after losing it on the exit from the amazing Eau Rouge. "Yeah, Eau Rouge is flat," he smiled, uninjured, afterwards. His qualifying lap was on the limit and looked it, earning the Canadian a coveted smile of appreciation from Frank Williams himself. Mika Salo also had a major off in almost the same place as Villeneuve, his Arrows irreparable for the race. Salo was detained by the medics for a while after admitting that he was a bit winded. Salo, who has a reputation for not crashing, would not avoid the carnage on race day either. The forecast said warmer and dry. Instead, it started raining early on Saturday morning and didn't stop until well after the crowds had left at the end of what was to be a very eventful day. Rain-meister Schumacher propelled his Ferrari around Spa the quickest during the warm up, followed by Irvine, Hakkinen, Fisichella, Ralf Schumacher and Hill. 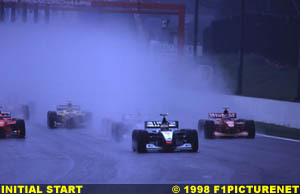 The conditions weren't constant and as the cars lined up for the start, only Jacques Villeneuve, Jean Alesi and - more importantly - Michael Schumacher, had opted for intermediate wet tyres. 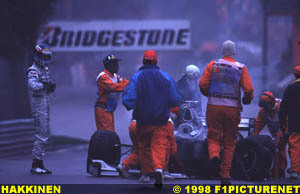 Everyone else, including Hakkinen, Coulthard, Hill and Irvine, were taking no chances and had full wets bolted on. 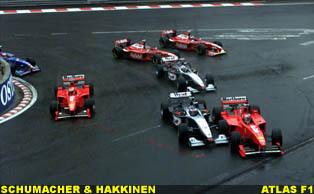 As the lights went out, Hakkinen made a good start, but Coulthard didn't. Villeneuve made the best start and after rounding La Source he was challenging Hakkinen for the lead. Hill also suffered too much wheelspin and fell back to around 7th from 3rd. Michael Schumacher made a good enough start to follow Villeneuve and Hakkinen, but as the leaders left La Source, mayhem started to break loose behind them. The spray was blinding in the wake of the leaders and it was difficult to see what triggered it all, but the most commonly held belief after the race was that Irvine touched Coulthard, sending the McLaren sharply right across the mid-field runners, crashing into a concrete barrier. There were wheels and carbon fibre debris flying in all directions - it was chilling to watch. But as the drivers begun extricating themselves from their stranded cars, it was soon clear that nobody had been hurt badly. 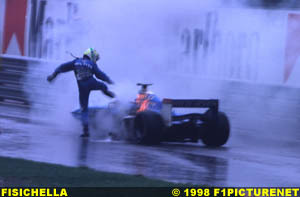 While Barrichello's injured arm prevented him from restarting, other drivers were unable to restart because only one spare car was available - for their team mate. The unlucky included Rosset, Panis and Salo. It took almost an hour for the wreckage to be cleared, the spare cars hastily readied. Irvine lined up in Schumacher's spare car and Coulthard was in the spare McLaren. Only Jordan escaped the shunt unscathed, with Ralf Schumacher neatly parking his car to one side as all hell broke loose to his front and right. Later, Ralf recounted: "It was quite funny because I just spotted a McLaren sideways in front of me and then I saw the mess going on all around me. So I moved my car left, parked it in neutral and waited, just in time to see an Arrows suddenly missing me by about ten centimetres. Then when everything had settled, I just engaged a gear and went through." Not bad for a driver who had previously built himself a reputation for being reckless at starts. For Ralf Schumacher's team mate, Damon Hill, the signs were that luck was on his side today. He had made a terrible first start and was now being given a second chance. The rain had subsided a little and now all of the front runners, including Hill, were on intermediate rain tyres. This time, Hill got it perfectly right and coolly sailed past the two McLarens as they rounded the La Source hairpin at the second attempt. As Hill savoured the clear road ahead, Hakkinen was enduring a lightning nightmare. His McLaren Mercedes snapped round 180 degrees as he exited La Source. He later explained that he had been helped round by a contact with Michael Schumacher's Ferrari. Stationary and pointing the wrong way, he had a grandstand view of his own ultimate demise as Johnny Herbert's Sauber slammed into him despite making a desperate avoiding action. Both were out on the spot and the safety car was immediately called into action. At least the race wouldn't be stopped for a second time. But if this wasn't bad enough for McLaren, Coulthard was off line on the first lap struggling to regain control and the Benetton of Alexander Wurz couldn't avoid him. Both ended up in the gravel trap, but Coulthard was just able to get going again at the tail of the field. The top ten order as the pack line up behind the safety car was Hill, Michael Schumacher, Irvine, Jean Alesi - making a great start from tenth, Villeneuve, Frentzen, Ralf Schumacher, Fisichella, Diniz and Verstappen. The stranded Sauber and McLaren were quickly shifted and two laps later the race was on again. Hill's Jordan, on intermediate settings with the hope that the track would dry progressively, looked confident initially. 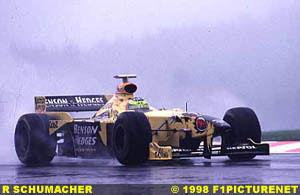 For the first three or four laps in anger Hill was able to maintain a cushion of just over a second on Schumacher's Ferrari, but then the rain started to get worse and it was soon evident that the Jordan was struggling. Nevertheless, it was a very strange sight indeed seeing Hill and a Jordan leading the race. But it wasn't until lap 7 that Schumacher out-braked Hill into the Bus Stop. 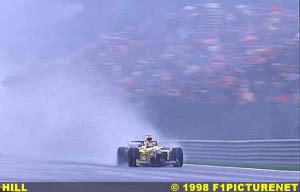 On lap nine, despite the worsening conditions, Schumacher set the fastest lap of the race, some two seconds faster than Hill's best on lap five. The Ferrari looked especially good under braking. By lap 8, the sole remaining Stewart piloted by Jos Verstappen was out with yet another blown Ford V10. On lap 9 Irvine broke his front wing and a barge board after missing a chicane and clobbering a kerb. A lengthy pit stop remedied the broken bits and pieces and he also took the opportunity to change to full wet tyres. By lap 11, Ralf Schumacher was in to the pits from sixth place to swap his intermediate tyres to full wets - a key change in strategy which would earn a generous reward a few laps later. He only lost a single place upon rejoining. On lap 16, all the leading runners who were still on intermediates pitted for full wets - except Villeneuve. The reigning world champion paid the price a lap later just before his own stop was due, aquaplaning off into the barriers - along a straight section of the road. Hill's stop was slightly fraught as the mechanics changed the front wing settings to generate more downforce. The mechanic to Hill's right managed to get his Allen key stuck in the adjuster and needed help from another mechanic to free it. Whatever, the car was still essentially set up for intermediate conditions, but Hill and Schumacher had, by this time, pulled out a big gap to the rest. On lap 17, Hill was in a Schumacher sandwich 22 seconds behind Michael, but 22 seconds ahead of Ralf, who had emerged a grateful third after the stops. The second Jordan was followed by Alesi, Frentzen, Irvine - another beneficiary of an early stop for full wets, Diniz and Fisichella. Trulli was behind Fisichella and like Diniz, was on a one-stop strategy, both pitting on lap 21. For a few laps things remained fairly uneventful, though by this time Coulthard was hollering down his radio to get the safety car back out. By lap 24, Ralf Schumacher had cut his team mate's lead down to just ten seconds and Big Brother Michael was now almost 30 seconds ahead of Hill. On the previous lap Michael almost had a coming together with Diniz. Now, a short distance ahead, Coulthard was in front, waiting to be lapped by the leader. After over a lap of following Coulthard's spray, Schumacher radioed his pits, and Ferrari team boss, Jean Todt, was down at the McLaren pit to request Coulthard be told to let Schumacher past. Coulthard knew what the situation was and expected the Ferrari any moment. Michael, though, seemed to be a man on a mission. Although his championship rival was out, he was leading the next guy by 30 seconds and pulling away at two seconds a lap and he seemed frustrated that the McLaren was in his way, even waving his fist at it. Certainly, the conditions were now at their most treacherous and one assumed that you would have to pick your moment carefully before attempting to pass. Coulthard said later that he couldn't see anything behind him. Could Schumacher see the red beacon at the rear of the McLaren switched on in bad visibility? Inexplicably the Ferrari's right front wheel hit the McLaren's rear, tearing it off and ending Schumacher's race instantly. Both cars managed to limp on, the three-wheeled Ferrari looking amazingly stable considering the damage and line astern as they entered the pit lane, Schumacher to retire and Coulthard to have his car repaired in the vain quest for an extra point. Schumacher angrily threw his steering wheel at a mechanic, launched himself out of the car and headed straight for the front of the garage. He was so quick that the garage door hadn't yet been closed. There was look of pure anger on Schumacher's face - a look we'd never seen from him before. He pushed aside a Ferrari aide trying to restrain him and marched into the McLaren garage, confronted Coulthard who was also out of his car, but still had his helmet donned. Even the diminutive figure of Jean Todt was trying to pull Schumacher back. Then suddenly, Schumacher turned and left, walking past the Jordan pit crew who were just beginning to realise that their cars were now first and second. Later, David Coulthard explained the situation from his point of view: "I'd seen the blue flag, the team had informed me because obviously it was very difficult to see in my mirrors because the conditions here were terrible with the amount of spray. They'd informed me that Michael was behind me and that I should let him past. And I went through the left hand corner just before running down to Pouhon, maintained my speed to allow him to overtake me before Pouhon and he ran into the back of me. Obviously it was a regretful incident; there's no way I wanted to get in the way of his race, but his behaviour in coming into the garage and accusing me of 'F-ing trying to kill him' is just unacceptable. You know, when I've had incidents with Michael in the past, I've waited until afterwards and spoken to him man to man, face to face to discuss the incident. We can't change what's happened, but his behaviour afterwards was just unacceptable." The Scot then added: "It's disgusting behaviour for someone who has got such a fantastic record for driving in this sport. He really needs to get some sort of help for controlling his anger after such an event." So, with 19 laps to go, Damon Hill found himself back in the lead, but he was now under severe pressure from his team mate, Ralf. Eddie Jordan rightfully wanted to avoid an embarrassing clash between his two drivers and Ralf was given the order to follow Damon home. But with Ralf currently suing Jordan to release him from his contract so he can go to Williams next year, there was a sense that he might just choose to ignore team orders and go for the win. After all, Hill was clearly struggling and on lap 28 he over-shot the Bus Stop chicane, running across the grass. However, he retained his lead after his final stop just as the safety car came out once again in response to a nasty incident between Fisichella's Benetton and Nakano's Minardi. In a sort of action replay of the Schumacher/Coulthard incident, Nakano was unseen by the following Fisichella, this time at the Bus Stop chicane. Fisichella hit the back of the Minardi very hard and most of the left hand side of the Benetton was shredded. Amazingly, Nakano was able to continue after repairs. Irvine was out too, his Ferrari clipping a kerb and spinning him way off the track into the gravel. The disaster for Ferrari was complete. With some twelve laps to go and the safety car back in the pit lane, Hill lead a dutiful Ralf Schumacher and Jean Alesi's Sauber. It was increasingly clear that Ralf was going to honour his team orders, but he was under some pressure from Alesi. Later, Alesi conceded that he wasn't going to take any big risks in trying to pass Ralf. 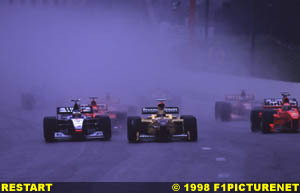 Frentzen and Diniz could not stay with these three, however, while Trulli would survive in sixth, earning a valuable first championship point for Prost, albeit two laps down on the leaders. 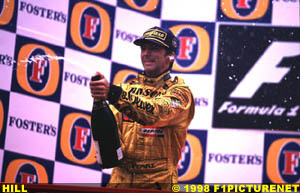 The race duly ended on lap 44 with Damon Hill acknowledging the frantic yellow mass on the Jordan pit wall with a victorious punch in the air. This was history in the making - after 127 races and seven years, Jordan had won their first Grand Prix, and with a 1-2 at that. On the podium, Ralf looked less than ecstatic. He must have had a lot on his mind - his brother's situation, the fact that he was trying to leave a now-winning team, that Hill had had the upper hand and that in the end, the race was actually there for the taking. However, when interviewed he was diplomatic: "I'm really happy for the team and also for myself. Sometimes you see the possibility to win a race and you're second and you don't realise what you have achieved. In the end I'm still very happy with the whole situation and the second place." Afterwards Hill said of the victory and his team: "It's a great feeling - everyone's so happy. I've never seen such a happy bunch of people and they thoroughly deserved it." He also said it was really Eddie Jordan's day. Eddie recalled: "Spa has been very kind to me I have to say, both in F3 and F3000, we've been on pole position here, we were second here last year, but nothing even comes close to this; I think we did style and dignity - Damon lead from the very start and to finish 1-2 you have to be pushing very hard and be competitive. The turn-around has been really phenomenal. Five races or six races ago we were absolute also-rans to being first and second here and scoring points at every race since then. So, yeah - it's a great feeling, I have to say!" However, for the leading teams and drivers of the World Championship, the unforgettable race of the Belgium Grand Prix, 1998, - the race which marks Ferrari's 600th Grand Prix and McLaren's 30th anniversary since their first Grand Prix win - that race, was a nightmare to forget. Ian Burley � 1998 Atlas Fourmula One Journal.